Synopsis: Millions of working Americans talk, act, and vote as if their economic interests match those of the megawealthy, global corporations, and the politicians who do their bidding. How did this happen? According to Air America radio host Thom Hartmann, the apologists of the Right have become masters of the subtle and largely subconscious aspects of political communication. It's not an escalation in Iraq, it's a surge; it's not the inheritance tax, it's the death tax; it's not drilling for oil, it's exploring for energy. Conservatives didn't intuit the path to persuasive messaging; they learned these techniques. There is no reason why progressives can't learn them too. In Cracking the Code, Hartmann shows you how. Drawing on his background as a psychotherapist and advertising executive as well as a national radio host, he breaks down the structure for effective communication, sharing exercises and examples for practical application. Too many Americans are acting against their best interests, buying into a right-wing line whose practical effect is to leave them marginalized and struggling. Why are the representatives the Right able to make their message so appealing? Because they've learned the techniques of effective communication--and you can too. Drawing on his rich background as a psychotherapist and advertising executive as well as a nationally syndicated Air America radio host, Thom Hartmann tells how to communicate the progressive message in a compelling and persuasive way. He explains what science has learned about how people actually perceive information and shows how to use this knowledge to truly connect with people. 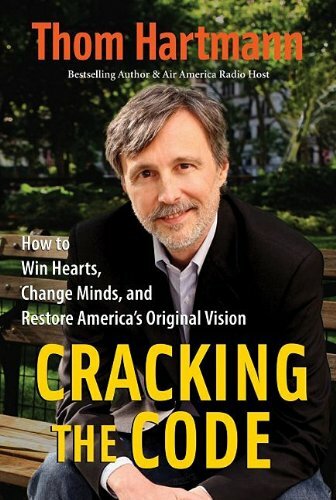 Cracking the Code gives you the tools you need to refute right-wing propaganda and reclaim America as a nation of We the People. "No one communicates more thoughtfully or effectively on the radio airwaves than Thom Hartmann. He gets inside the arguments and helps people to think them through--to understand how to respond when they're talking about public issues with coworkers, neighbors, and friends. This book explores some of the key perspectives behind his approach, teaching us not just how to find the facts, but to talk about what they mean in a way that people will hear." "Thom Hartmann's book is an excellent primer in communication techniques. But unlike other message makers, Hartmann has genuine substance. He is restoring the radical populist tradition to the mainstream of our culture. Much of what we revere as Americans, Hartmann believes, was created by radicals who simply were ahead of their time." --Peter Coyote, actor and author of Sleeping Where I Fall "In Cracking the Code, Thom Hartmann, America's most popular, informed, and articulate progressive talk show host and political analyst, tells us what makes humans vulnerable to unscrupulous propagandists and what we can do about it. It is essential reading for all Americans who are fed up with right-wing extremists manipulating our minds and politics to promote agendas contrary to our core values and interests."